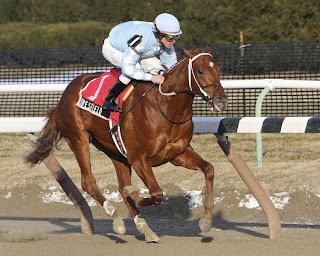 Turf & Dirt - On Horse Racing: Old Fashioned still on Top...Top 25 Derby Contenders & Connections! Old Fashioned still on Top...Top 25 Derby Contenders & Connections! Okay, no big surprises in the Southwest. Old Fashioned still on top til someone knocks him off. Pioneerof the Nile inherits #2...but no dirt proof. Friesan Fire faced only marginal competition. Patena seems to be getting a lot of hype off of a second place Lecomte finish. Stardom Bound won't in Derby if Patena makes it. Papa Clem moves up after a nice showing in the Robt. Lewis. Vineyard Haven...biggest disappointment of the week. Haynesfield will have trouble at distance. Imperial Council...okay, okay..I'll move him up a notch or two! This One's For Phil, could be a good dark horse! 10 THE PAMPLEMOUSSE Kafwain Julio Canani Bienstock & Winner Stable, A. Solis II Alex Solis 2/28 SA Sham S.